"Côte d'Azur" redirects here. For other uses, see Côte d'Azur (disambiguation). "Blue Coast" redirects here. For other uses, see Blue Coast Records. A view along the "Promenade des Anglais" in Nice at night. 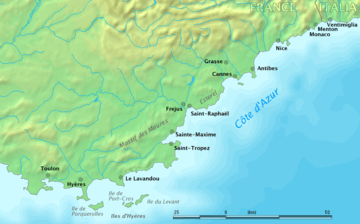 Map showing the extent of the Côte d'Azur. The Côte d'Azur (French pronunciation: ​[kot daˈzyʁ]; Occitan: Còsta d'Azur; literally: 'Coast of Azure'), often known in English as the French Riviera, is the Mediterranean coastline of the southeast corner of France, also including the sovereign state of Monaco. There is no official boundary, but it is usually considered to extend from the Italian border (Italian Riviera) in the east to Saint-Tropez, Hyères, Toulon, or Cassis in the west. Its largest city is Nice, which has a population of 347,060 (2006). 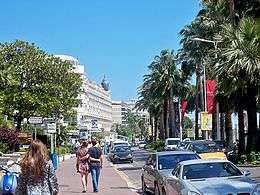 The city is the center of a communauté urbaine – Nice-Côte d'Azur – bringing together 24 communes and more than 500,000 inhabitants and 933 080 in the urban area. Nice is home to Nice Côte d'Azur Airport, France's third-busiest airport (after Paris-Charles de Gaulle Airport and Paris-Orly), which is on an area of partially reclaimed coastal land at the western end of the Promenade des Anglais. A second airport at Mandelieu was once the region's commercial airport, but is now mainly used by private and business aircraft. The A8 autoroute runs through the region, as does the old main road generally known as the Route nationale 7 (officially now the D N7 in the Var and the D6007 in the Alpes-Maritimes). Trains serve the coastal region and inland to Grasse, with the TGV Sud Est service reaching Nice-Ville station in five and a half hours from Paris. The French Riviera has a total population of more than two million. 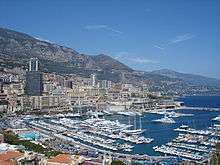 It contains the seaside resorts of Cap-d'Ail, Beaulieu-sur-Mer, Saint-Jean-Cap-Ferrat, Villefranche-sur-Mer, Antibes, Juan-les-Pins, Cannes, Saint-Raphaël, Fréjus, Sainte Maxime and Saint-Tropez, It is also home to a high-tech/science park or technopole at Sophia-Antipolis (north of Antibes), and a research and technology center at the University of Nice Sophia-Antipolis. The region has 35,000 students, of whom 25 percent are working toward a doctorate. The French Riviera is a major yachting and cruising area with several marinas along its coast. 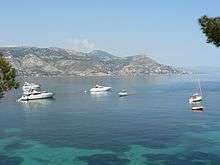 According to the Côte d'Azur Economic Development Agency, each year the Riviera hosts 50 percent of the world's superyacht fleet, with 90 percent of all superyachts visiting the region's coast at least once in their lifetime. As a tourist center, French Riviera benefits from 310 to 330 days of sunshine per year, 115 kilometres (71 mi) of coastline and beaches, 18 golf courses, 14 ski resorts and 3,000 restaurants. The name Côte d'Azur was given to the coast by the writer Stéphen Liégeard in his book, La Côte d’azur, published in December 1887. Liégeard was born in Dijon, in the French department of Côte-d'Or, and adapted that name by substituting the azure blue color of the Mediterranean for the gold of Côte-d'Or. In Occitan (Niçard and Provençal) and French, the only usual names are Còsta d'Azur in Occitan and Côte d'Azur in French. A name like "French Riviera" (Ribiera Francesa in Occitan, Riviera Française in French) is unusual and sounds odd; it could only work as a word-to-word translation of the British point of view. 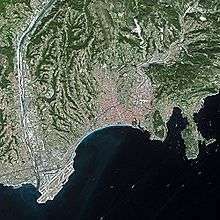 For instance, in French, "Riviera Française" is found in the online Larousse encyclopedia to refer to the holidays of a group of English workers (moreover, in Occitan, the word ribiera "coastline" mostly works as a common name, whereas in French, the old-fashioned term Rivière de Gênes was used to refer to the Italian Riviera whose center is Genoa). The Old Town district of Menton, which is the last town on the Côte d'Azur before the Italian frontier. The Côte d'Azur and the French Riviera have no official boundaries. Some sources put the western boundary at Saint-Tropez in the Var département. Others include Saint Tropez, Hyères or Toulon in the Var (departement), or as far as Cassis in the Bouches-du-Rhône département. 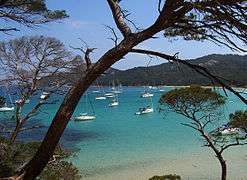 In her 1955 novel, The Talented Mr. Ripley, Patricia Highsmith describes the Riviera as including all of the coast between Toulon and the Italian border. The Côte d'Azur has been inhabited since prehistoric times. Primitive tools dating to between 1 million and 1.050 million years were discovered in the Grotte du Vallonnet, near Roquebrune-Cap-Martin, with stones and bones of animals, including bovines, rhinoceros, and bison. At Terra Amata (380,000 to 230,000 BC), near the Nice Port, a fireplace was discovered that is one of the oldest found in Europe. Stone dolmens, monuments from the Bronze Age, can be found near Draguignan, while the Valley of Marvels (Vallée des Merveilles) near Mount Bégo, at 2,000 m (6,600 ft) elevation, is presumed to have been an outdoor religious sanctuary, having over 40,000 drawings of people and animals, dated to about 2000 BC. Beginning in the 7th century BC, Greek sailors from Asia Minor began to visit and then build trading posts (emporia) along the Côte d'Azur. Emporia were started at Olbia (Saint-Pierre-de-l'Almanarre, near Hyères); Antipolis (Antibes) and Nikæa (Nice). These settlements, which traded with the inhabitants of the interior, became rivals of the Etruscans and Phoenicians, who also visited the Côte d'Azur. 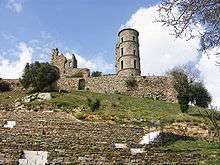 Roman towns, monuments and amphitheatres were built along the Côte d'Azur and many still survive, such as the amphitheatre and baths at Cimiez, above Nice, and the amphitheatre, Roman walls and other remains at Fréjus. 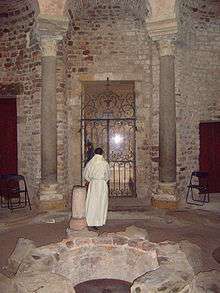 The 5th-century baptistery of Fréjus Cathedral, which is still in use. In the same period, Christianity started to become a powerful force in the region. The first cathedrals were built in the 4th century, and bishoprics were established: in Fréjus at the end of the 4th century, Cimiez and Vence in 439, and Antibes in 442. The oldest Christian structure still in existence on the Côte d'Azur is the baptistery of Fréjus Cathedral, built at the end of the 5th century, which also saw the founding of the first monastery in the region, Lerins Monastery on an island off the coast at Cannes. Some peace was restored to the coast by the establishment in 879 of a new kingdom of Provence, ruled first by the Bosonids dynasty (879–1112), then by the Catalans (1112–1246), and finally by the Angevins (1246–1382, elder branch, 1382–1483 (younger branch). The ruins of the Grimaldi castle at Grimaud, near Saint-Tropez. In the 13th century, another powerful political force appeared, the House of Grimaldi. Descended from a Genoese nobleman expelled from Genoa by his rivals in 1271, members of the different branches of the Grimaldis took power in Monaco, Antibes and Nice, and built castles at Grimaud, Cagnes-sur-Mer and Antibes. Albert II, the current Prince of Monaco is a descendant of the Grimaldis. In 1388, the city of Nice and its surrounding territory, from the mouth of the Var to the Italian border, were separated from Provence and came under the protection of the House of Savoy. The territory was called the Comté de Nice after 1526, and thereafter its language, history and culture were separate from those of Provence until 1860, when it was re-attached to France under Napoleon III. Provence retained its formal independence until 1480, when the last Comte de Provence, René I of Naples, died and left the Comté to his nephew, Charles du Maine, who in turn left it to Louis XI of France. In 1486, Provence formally became part of France. A new phase began when the coast became a fashionable health resort for the British upper class in the late 18th century. The first British traveller to describe its benefits was the novelist Tobias Smollett, who visited Nice in 1763 when it was still an Italian city within the Kingdom of Sardinia. Smollett brought Nice and its warm winter climate to the attention of the British aristocracy with Travels through France and Italy, written in 1765. At about the same time, a Scottish doctor, John Brown, became famous for prescribing what he called climato-therapy, a change in climate, to cure a variety of diseases including tuberculosis, known then as consumption. The French historian Paul Gonnet wrote that, as a result, Nice was filled with "a colony of pale and listless English women and listless sons of nobility near death". In 1834, a British nobleman and politician named Henry Peter Brougham, First Baron Brougham and Vaux, who had played an important part in the abolition of the slave trade, travelled with an unwell sister to the south of France, intending to go to Italy. A cholera epidemic in Italy forced him to stop at Cannes, where he enjoyed the climate and scenery so much that he bought land and built a villa. He began to spend his winters there and, owing to his fame, others followed: Cannes soon had a small British enclave. In 1864, six years after Nice became part of France following the Second Italian War of Independence the first railway was completed, making Nice and the Riviera accessible to visitors from all over Europe. One hundred thousand visitors arrived in 1865. By 1874, residents of foreign enclaves in Nice, most of whom were British, numbered 25,000. In the mid-19th century British and French entrepreneurs began to see the potential of promoting tourism along the Côte d'Azur. At the time, gambling was illegal in France and Italy. 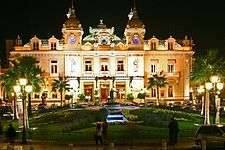 In 1856, the Prince of Monaco, Charles III, began constructing a casino in Monaco, which was called a health spa to avoid criticism by the church. The casino was a failure, but in 1863 the Prince signed an agreement with François Blanc, a French businessman already operating a successful casino at Baden-Baden (southwestern Germany), to build a resort and new casino. Blanc arranged for steamships and carriages to take visitors from Nice to Monaco, and built hotels, gardens and a casino in a place called Spélugues. At the suggestion of his mother, Princess Caroline, Charles II renamed the place Monte Carlo after himself. When the railway reached Monte Carlo in 1870, many thousands of visitors began to arrive and the population of the principality of Monaco doubled. The French Riviera soon became a popular destination for European royalty. Just days after the railway reached Nice in 1864, Tsar Alexander II of Russia visited on a private train, followed soon afterwards by Napoleon III and then Leopold II, the King of the Belgians. Queen Victoria was a frequent visitor. In 1882 she stayed in Menton, and in 1891 spent several years at the Grand Hotel at Grasse. In 1892 she stayed at the Hotel Cost-belle in Hyères. 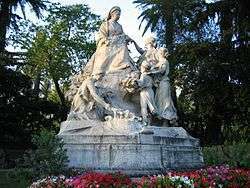 In successive years from 1895 to 1899 she stayed in Cimiez in the hills above Nice. First, in 1895 and 1896, she patronised the Grand Hôtel, while in later years she and her staff took over the entire west wing of the Excelsior Hôtel Régina, which had been designed with her needs specifically in mind (part of which later became the home and studio of the renowned artist Henri Matisse). She travelled with an entourage of between sixty and a hundred, including chef, ladies in waiting, dentist, Indian servants, her own bed and her own food. The Prince of Wales was a regular visitor to Cannes, starting in 1872. He frequented the Club Nautique, a private club on the Croisette, the fashionable seafront boulevard of Cannes. He visited there each spring for a two-month period, observing yacht races from shore while the royal yacht floated, Britannia, was sailed by professional crewmen. After he became King in 1901, he never again visited the French Riviera. By the end of the 19th century the Côte d'Azur began to attract artistic painters, who appreciated the climate, the bright colors and clear light. Among them were Auguste Renoir, who settled in Cagnes-sur-Mer and in Mougins, Henri Matisse and Pablo Picasso. The First World War brought down many of the royal houses of Europe and altered the nature and the calendar of the French Riviera. Following the war, greater numbers of Americans began arriving, with business moguls and celebrities eventually outnumbering aristocrats. The 'High Society' scene moved from a winter season to a summer season. Americans began coming to the south of France in the 19th century. Henry James set part of his novel, The Ambassadors, on the Riviera. James Gordon Bennett Jr, the son and heir of the founder of the New York Herald, had a villa in Beaulieu. Industrialist John Pierpont Morgan gambled at Monte Carlo and bought 18th-century paintings by Fragonard in Grasse – shipping them to the Metropolitan Museum in New York. A feature of the French Riviera in the inter-war years was the Train Bleu, an all first-class sleeper train which brought wealthy passengers down from Calais. It made its first trip in 1922, and carried Winston Churchill, Somerset Maugham, and the future King Edward VIII over the years. While Europe was still recovering from the war and the American dollar was strong, American writers and artists started arriving on the Côte d'Azur. Edith Wharton wrote The Age of Innocence (1920) at a villa near Hyères, winning the Pulitzer Prize for the novel (the first woman to do so). Dancer Isadora Duncan frequented Cannes and Nice, but died in 1927 when her scarf caught in a wheel of the Amilcar motor car in which she was a passenger and strangled her. The writer F. Scott Fitzgerald first visited with his wife Zelda in 1924, stopping at Hyères, Cannes and Monte Carlo – eventually staying at Saint-Raphaël, where he wrote much of The Great Gatsby and began Tender is the Night. While Americans were largely responsible for making summer the high season, a French fashion designer, Coco Chanel, made sunbathing fashionable. She acquired a striking tan during the summer of 1923, and tans then became the fashion in Paris. During the abdication crisis of the British Monarchy in 1936, Wallis Simpson, the intended bride of King Edward VIII, was staying at the Villa Lou Vieie in Cannes, talking with the King by telephone each day. After his abdication, the Duke of Windsor (as he became) and his new wife stayed at the Villa La Croe near Antibes. The English playwright and novelist Somerset Maugham also became a resident in 1926, buying the Villa Mauresque toward the tip of Cap Ferrat, near Nice. When Germany invaded France in June 1940, the remaining British colony was evacuated to Gibraltar and eventually to Britain. American Jewish groups helped some of the Jewish artists living in the south of France, such as Marc Chagall, to escape to the United States. In August 1942, 600 Jews from Nice were rounded up by French police and sent to Drancy, and eventually to death camps. In all about 5,000 French Jews from Nice perished during the war. On 15 August 1944, American parachute troops landed near Fréjus, and a fleet landed 60,000 troops of the American Seventh Army and French First Army between Cavalaire and Agay, east of Saint-Raphaël. German resistance crumbled in days. Saint-Tropez was badly damaged by German mines at the time of the liberation. The novelist Colette organized an effort to assure the town was rebuilt in its original style. When the war ended, artists Marc Chagall and Pablo Picasso returned to live and work. The marriage of American film actress Grace Kelly to Prince Rainier of Monaco on 18 April 1956, attracted world attention once again. It was viewed on television by 30 million people. 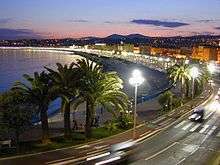 During the 1960s, the Mayor of Nice, Jacques Médecin, decided to reduce the dependence of the Riviera on ordinary tourism, and to make it a destination for international congresses and conventions. He built the Palais des Congrès at the Acropolis in Nice, and founded a Chagall Museum and a Matisse Museum at Cimiez. High-rise apartment buildings and real estate developments began to spread. At the end of August, 1997, Princess Diana and Dodi Fayed spent their last days together on his father's yacht off Pampelonne Beach near Saint-Tropez, shortly before they were killed in a traffic accident in the Alma Tunnel in Paris. Cap Ferrat; Plage la Paloma, a beach on the Côte d'Azur. Boulevard de la Croisette along the waterfront in Cannes. 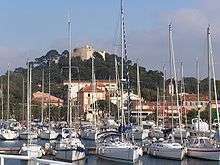 Port of Porquerolles, an island in Var. 75,000 jobs tourism is 18 percent of total employment in the Alpes-Maritimes. The Côte d'Azur receives more rainfall than Paris annually (803.3 mm annually in Nice and 684.8 mm in Toulon compared with 649.8 mm in Paris), but the rainy days are much less frequent; 111 rainy days a year in Paris compared with 61 days in Toulon and 63 in Nice. Toulon has 2,793 hours of sunshine a year, Nice has 2,668 hours. Micro-climates exist in these coastal regions, and there can be great differences in the weather between various locations. Strong winds such as the Mistral, a cold dry wind from the northwest or from the east, are another characteristic, particularly in the winter. Rain can be torrential, particularly in the autumn, when storms and rain are caused by the difference between the colder air inland and the warm Mediterranean water temperature (20 °C-24 °C, 68 °F-75 °F). The rainiest months are September (75.6 mm average rainfall); October (143.9 mm); November (94.3 mm) and December (87.8 mm). Snow is rare, falling once every ten years. 1956 was exceptional, when 20 centimetres (7.9 in) blanketed the coast. In January 1985 the coast between Cannes and Menton received 30 to 40 centimetres (12 to 16 in). In the mountains, snow is present from November to May. 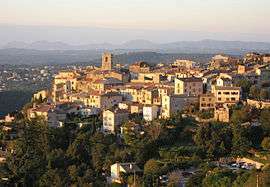 The département of the Var (which includes Saint-Tropez and Hyères) has a climate slightly warmer, drier and sunnier than Nice and the Alpes-Maritimes, but is less sheltered from the wind. The Mistral wind, which brings cold and dry air down from the upper Alpine regions via the Rhône Valley and extends with diminishing intensity along the Côte d'Azur, blows frequently during the winter. Strong winds blow for about 75 days a year in Fréjus. Juan-les-Pins; Jazz à Juan, late July. 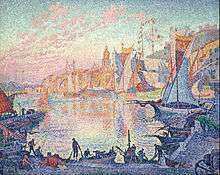 Paul Signac, The Port of Saint-Tropez, oil on canvas, 1901. Pierre Bonnard (1867–1947); retired to and died at Le Cannet. Georges Braque (1882–1963); painted frequently at L'Estaque between 1907 and 1910. Roger Broders (1883–1953); Parisian travel poster illustrator. Paul Cézanne (1839–1906); a native of Aix-en-Provence, Cézanne painted at L'Estaque between 1878 and 1882. Marc Chagall (1887–1985); lived in Saint-Paul-de-Vence between 1948 and 1985. Henri-Edmond Cross (1856–1910); discovered the Côte d'Azur in 1883, and painted at Monaco and Hyères. Maurice Denis (1870–1943); painted at St. Tropez and Bandol. André Derain (1880–1954); painted at L'Estaque and Martigues. Raoul Dufy (1877–1953); whose wife was from Nice, painted in the region, including in Nice, Marseille and Martigues. Albert Marquet (1873–1947); painted at Marseille, St. Tropez and L'Estaque. Henri Matisse (1869–1954); first visited St. Tropez in 1904. In 1917 he settled in Nice, first at the Hôtel Beau Rivage, then at the Hôtel de la Méditerranée, then at la Villa des Alliés in Cimiez. In 1921 he lived in an apartment in Nice, next to the flower market and overlooking the sea, where he lived until 1938. He then moved to the Hôtel Régina in the hills of Cimiez, above Nice. During World War II he lived in Vence, then returned to Cimiez, where he died and is buried. Claude Monet (1840–1927); visited Menton, Bordighera, Juan-les-Pins, Monte Carlo, Nice, Cannes, Beaulieu and Villefranche, and painted a number of seascapes of Cap Martin, near Menton, and at Cap d'Antibes. Edvard Munch (1863–1944); visited and painted in Nice and Monte Carlo (where he developed a passion for gambling), and rented a villa at Saint-Jean-Cap-Ferrat in 1891. Pablo Picasso (1881–1973); spent each summer from 1919 to 1939 on the Côte d'Azur, and moved there permanently in 1946, first at Vallauris, then at Mougins, where he spent his last years. Auguste Renoir (1841–1919); visited Beaulieu, Grasse, Saint-Raphaël and Cannes, before finally settling in Cagnes-sur-Mer in 1907, where he bought a farm in the hills and built a new house and workshop on the grounds. He continued to paint there until his death in 1919. His house is now a museum. Paul Signac (1863–1935); visited St. Tropez in 1892, and bought a villa, La Hune, at the foot of citadel in 1897. It was at his villa that his friend, Henri Matisse, painted his famous Luxe, Calme et Volupté in 1904. Signac made numerous paintings along the coast. Yves Klein (1928–1962); a native of Nice, considered an important figure in post-war European art. Sacha Sosno (1937-2013); French painter and sculptor living and working in Nice. Aldo Bastié, Histoire de la Provence, Éditions Ouest-France, 2001. Mary Blume, Côte d'Azur: Inventing the French Riviera, Thames and Hudson, London, 1992. Patrick Howarth, When the Riviera was Ours, Routledge & Kegan Paul, London, 1977. Jim Ring, Riviera, the Rise and Fall of the Côte d'Azur, John Murray Publishers, London, 1988. La Méditerranée de Courbet à Matisse, catalog of the exhibit at the Grand Palais, Paris from September 2000 to January 2001. Published by the Réunion des musées nationaux, 2000. Wikimedia Commons has media related to French Riviera. Wikivoyage has a travel guide for French_Riviera. 1 2 "Côte d'Azur, côte méditerranéenne française entre Cassis et Menton" ("Côte d'Azur, French Mediterranean coast between Cassis and Toulon") in Dictionnaire Hachette encyclopédique (2000), p. 448. 1 2 "Côte d'Azur, Partie orientale du littoral français, sur la Méditerranée, de Cassis à Menton" ("Côte d'Azur, Eastern part of the French coast, on the Mediterranean, from Cassis to Menton"), in Le Petit Larousse illustré (2005), p. 1297. ↑ Jim Ring, Riviera, The Rise and Rise of the Cote d'Azur, John Murray Publishers, London, 2004. ↑ Marc Boyer, L'Invention de la Côte d'Azur : l'hiver dans le Midi, préface de Maurice Agulhon, 378 pages, Édition de l'Aube, 2002, ISBN 2-87678-643-5. ↑ In English, "Riviera" as a whole is defined as "the coastal strip along the Mediterranean from La Spezia, Italy, to west of Cannes, France." Webster's New World Dictionary of American English, Third College Edition, 1988. ↑ "Vocabolario: Riviera". Enciclopedia Italiana di Scienze, Lettere ed Arti. Istituzionali della Treccani. ↑ French online Larousse encyclopedia, article "Côte d'Azur". ↑ French online Larousse encyclopedia, article "Vacances d'été" ("Summer Holydays"). ↑ Harrap's Standard French and English Dictionary, 1948. ↑ Henry de Lumley, La Grande Histoire des premiers hommes europeens, pg. 120. ↑ Aldo Bastié, Histoire de la Provence, Edition Ouest-France, 2001. ↑ "1981–2010 Data". July 2012. ↑ "Nice, France". Climatebase.ru. Retrieved 10 July 2015. 1 2 3 Météo-France site.